We have an absolutely ideal location... amazing views and convenience too. 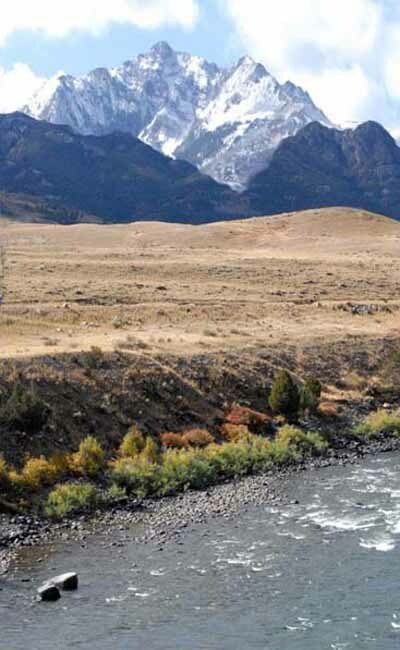 Start your days watching the gorgeous sunrise on Electric Peak (one of the highest mountains in Yellowstone National Park) right from the breakfast table with the gentle sounds of the Yellowstone River flowing by the property. Our vacation rental home is perched above the Yellowstone River with an expansive view overlooking Yellowstone National Park. Wildlife abounds! Watch eagles, osprey and ravens soar BELOW YOU over the River. From the dining room or deck off the back, we've watched a wolf pack pursue and take down a pronghorn, eagles catching fish in the river, bison herds grazing, elk swimming across the river and a pronghorn give birth to twins! You never know what you may see - it can be utterly amazing wildlife encounters or simply the awe inspiring beauty of the mountains and river. Our view is south facing, so there's lots of sunlight to soak in all day long. At the end of the day, grill on the deck while you watch the sunset reflections on the river and enjoy the "big sky" views of Montana and Yellowstone. The convenience of our property will make your vacation feel simplified and relaxed. You can walk to the grocery store, restaurants, ice cream and pizza too...check out the bookstore, gift shops or even white water rafting outfitters where they'll 'suit you up' and take you rafting down the river, right by your vacation home! Elk River Art Studio and Gallery is right next door (that's us! ), so stop in to see our studio and browse the art inspired by the landscape and animals you'll experience right outside your door. A little further, the Roosevelt Arch at the northern entrance to Yellowstone National Park is just a mile away. And just a couple miles from there, you can soak in the Boiling River - the hot springs in Yellowstone Park. There's A LOT to experience in Yellowstone (we certainly love it!) and we'd be happy to point you in the right direction and help make it a vacation of a lifetime for you.